Now here is a book with some sass! 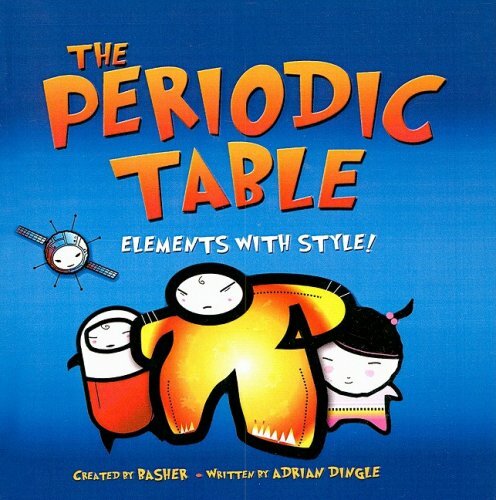 The Periodic Table of Elements with Style, by Simon Basher and Adrian Dingle, is an interesting mix of informational text about the periodic table of elements mixed with fictional stories, as told from the viewpoint of the elements themselves as a way to provide insights into each elements. I didn’t realize it until I turned the small, square book over, but this is one of a series of books in science that the two have done that keeps the theme of light-hearted informational text going. Each element page includes not only the short, accessible text (although you can see some vocabulary words that might need dissecting), but also the year it was discovered, the density of the element, as well as the melting and boiling points. From a science perspective, the book is an engaging informational text. From the literacy perspective, the book nicely demonstrates how we can weave in fictional, point-of-view writing with science information, with some fun art thrown in. I could see this book being a nice mentor text for a science class activity around literacy. Which is exactly what the Common Core is requiring us to do, right? Bring literacy into the ELA classroom and bring content-area learning into the ELA classroom. Here is my developing presentation around the concept of reading across various texts and synthesizing information in writing. I am developing this as part of a professional development I am leading in a few weeks. Feedback appreciated, as always. 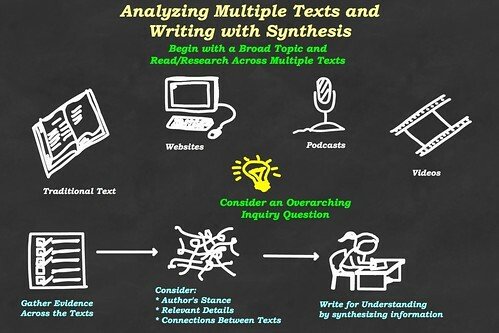 I’ve been searching around for some good information and resources around the teaching of reading across multiple texts and teaching synthesis skills (using evidence from multiple texts in writing). In some ways, this is different than a basic research project. But I have not found much that I find useful (if you have links or ideas, please leave me a comment). This diagram is one way for me to visualize what it is I am thinking about, and I will be using it in an upcoming workshop around reading and the Common Core. I’m gathering some resources for a day of Professional Development I am leading with my colleagues in a few weeks, with a focus on reading in connection to the Common Core. We will be doing some work along the lines of the concepts of “close reading,” and “synthesis,” and “text complexity” — all of which are at the heart of the expectations of our readers in all content areas. This Prezi is my first attempt at pulling together some coherent ideas around close reading, with some activities to be added at the end so that we do close reading ourselves. Let me know if I should add any ideas or resources, please. This video from The Teaching Channel, and the series of smaller segments, about how to teach reading so that kids are in the role of critical historian is powerful, and contains much of what the Common Core is talking about: connecting reading and literacy skills to the content areas, close reading strategies, and recognition of bias of documents. I’m not writing today about my usual topics about technology, digital media and writing. No, today, I am thinking about the technology requirements that the PARCC consortium (Partnership for Assessment of Readiness for College and Career) has just put forth for school districts as part of its upcoming assessment connected to the implementation of the Common Core. This is the nitty-gritty of the technology, not the creative side of things. You see, the assessment will be mostly administered online (I say, mostly, because there has been a clause I’ve seen that allows districts to opt out of the digital component, although I am not sure how long that opt-out will remain). E-readers, smartphones and other smaller mobile devices will not be supported by the PARCC assessment. You can read the document yourself at the PARCC site. EdWeek has a nice overview, too. The questions I have encountered in my own school and in other school districts has revolved around having enough computers for students taking the PARCC in a given school, and the legimate concern that those computers, labs and carts will be locked down for long time stretches for testing, and not for student use for creating and exploring with technology. I think that is a legitimate concern, don’t you? I don’t think its a secret here that I really found the website, InstaGrok, extremely helpful for my students as they did research for a project this year. InstaGrok allows students to channel their research, take notes right inside the search engine, investigate multmedia elements, and stay focused on a topic. 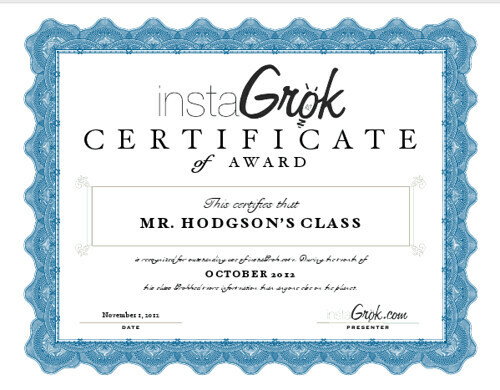 But I was a bit surprised the other day when the folks from InstaGrok let me know that my students had done the most searching on the site for the month of October. We conducted about 1,850 search queries. They sent along the nice certificate, which I put on our class website (and which I realize is a nice way for them to advertise their site, but so be it — I’ll repeat how useful I find it for my students as researchers), and my students were quite proud of themselves, even though I reminded them that quality always trumps quantity. But in looking at their accounts (which one can do as a teacher), I saw most of the gathering of information was directly related to their research projects. The Pew Research Center, along with the College Board and the National Writing Project, recently released the results of a survey of middle and high school teachers on the topic of technology’s influence on research skills of students. (You can read more about the study here at the NWP website or download the whole report from Pew). The results are not surprising, I think, but they are worth sharing and discussing. A few things become clear from this report and my own daily observations of my students, and I think many of teachers see this in their own classroom: While the Internet and other forms of technology have opened up amazing doors for information and connections for young researchers, it has also created the problem of filtering that flood of information into manageable and useable ideas. The role of the educator in regards to online research is never more necessarily than now, in this information age, particularly around the teaching of reliable sources, navigation strategies, citation of sources and more. We need to be doing more explicit teaching of these practices. The teachers surveyed rated students particularly low on their ability to recognize bias in online content (71% rate them fair or poor), and patience and determination in looking for information that is hard to find (78% give ratings of fair or poor). 42% of the teachers surveyed report their students use cell phones to look up information in class. At the same time, virtually all teachers surveyed report working in a school that employs internet filters (97%), formal policies about cell phone use (97%) and acceptable use policies or AUPs (97%). The degree to which these different policies impact their teaching varies, with internet filters cited most often as having a “major impact” on survey participants’ teaching (32%), followed by cell phone policies (21%) and AUPs (16%). Teachers in urban areas and those teaching the lowest income students are feeling the impact of these policies more than others. In particular, teachers of students living in poverty are at least twice as likely as those teaching the most affluent students to report these policies having a “major” impact on their teaching. This infographic from the report gives a good idea of the responses. These kinds of reports reinforce the need for us as teachers to really bring these skills into our classrooms. Mostly, librarians have been leading the way, and that is great. But all of us need to be finding ways to do more of this, and if you are a Common Core state – with its emphasis on research skills and using sources and synthesis of ideas — you really need to make inroads here. I’ve been doing more and more of this with my own sixth graders, setting the stage for larger research projects in the coming years. This is a decent overview webinar video from Teaching Channel that gives an overview of the Common Core, including some strategies for reading the document and making sense of the Common Core and the upcoming assessments. I’ll be the first to admit that I get turned off by publishers who put Common Core in the title of their teaching resource books. I know it probably sells books off the shelves like crazy (particularly for administrators desperate to be doing something, anything, to shift forward with their staff), but I am sensitive to marketing gimmicks. So when Common Core Literacy Lesson Plans, by editor Lauren Davis, arrived at my house from the publisher (Eye on Education), I was wary (although they get points for honesty in advertising, since the title pretty much directly sums up the content of the book in a no-nonsense way). In fact, the day after I got Common Core Literacy Lesson Plans, I was using one of its resources with a lesson that I had designed for my sixth graders around paraphrasing, summarizing and quoting from direct sources. This tied in perfectly with our inquiry research project, and the handout that we used from the book included as short piece of reading and three questions, which led to some great discussions in class about how to use sources without the “copy/paste” mentality. Over the next few days, as my students were writing, I reminded them about our work around paraphrasing and summarizing. I know I will be returning to this book when we get to our Digital Lives unit because some of the lessons and handouts here around evaluating websites and understanding the influence of media are part of the work that my students do to understand their role as writers and readers in the digital age. I’ll also be sharing it with my sixth grade teaching team as part of our Community of Practice meetings, as we talk about how to keep moving reading and writing and literacy more and more into the content areas.